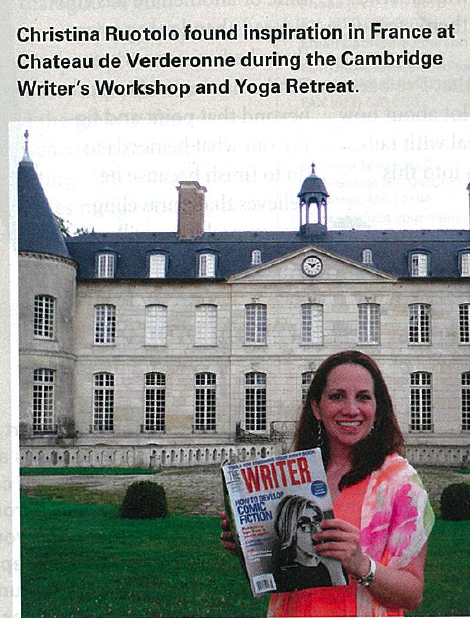 Christina Ruotolo, a participant at the Cambridge Writers’ Workshop 2014 Yoga & Writing Retreat at the Château at Verderonne, has been featured in The Writer Magazine! In addition to presenting her new creative writing and enjoying hors d’oeuvres and cocktails with her fellow workshop participants, Christina found inspiration for her work when reading The Writer at the Château de Vederonne. She also very much enjoyed the literary and cultural tours of Paris and Chantilly with the Cambridge Writers’ Workshop as well as her daily yoga classes with Elissa Lewis. Christina Ruotolo, 36, is a published poet and nonfiction writer who hails from eastern North Carolina. In 2014, she started a nonfiction blog, The Grief Project, after the loss of her mother in 2013, her father in early 2014, and a miscarriage a few months after that. “I used the blog as a way to navigate through my grief one thought and one word at a time. I want others to share their stories of grief and how they deal with the ups and downs that grief in all forms entail.” When not writing, Christina is an adjunct English instructor and Writing Consultant at Pitt Community College, a Barnes and Noble employee, and hard at work on a poetry chapbook and her first screenplay. If you would like to submit your story of how you dealt with grief to Christina’s blog, please visit the website, www.thegriefproject.blogspot.com.